Is Abercrombie & Fitch Changing Too Fast for Its Own Good? Abercrombie & Fitch has made more changes this year than it has in the past several years combined. In an effort to keep pace with industry rivals like American Eagle Outfitters and Gap, is Abercrombie & Fitch changing too fast too soon? After its stock fell nearly 30% in 2013, Abercrombie & Fitch (NYSE:ANF) has already seen its shares rebound over 30% year-to-date. Even though its recent earnings were some of the worst in the company's history, investors are starting to buy in on many of the changes that Abercrombie & Fitch has made and/or announced in the past few months. The apparel industry has been rough for all retailers over the past couple of years. Abercrombie & Fitch, American Eagle Outfitters (NYSE:AEO), and Gap (NYSE:GPS) have all had to make changes to keep up with evolving customer tastes and the challenging retail environment. However, is Abercrombie & Fitch now changing too fast for its own good? For the first quarter of fiscal 2014, revenue for Abercrombie & Fitch fell 2% to $822 million. The company produced a net loss of $23.7 million, much worse than the $7.2 million loss it suffered in the year-ago quarter, and easily its biggest loss in years. Comp sales across its Abercrombie & Fitch, Abercrombie & Fitch Kids, and Hollister brands fell 1%, 6%, and 7%, respectively. During last quarter's conference call, management said that reducing inventory levels was one of its top goals for fiscal 2014. However, during the first quarter inventory levels rose 6% in value. 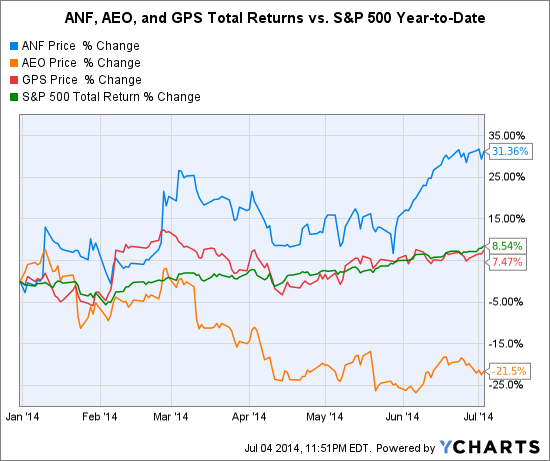 American Eagle Outfitters' first quarter was almost as bad. Revenue was down 5% to $646 million while net income fell to just $3.9 million. In the year-ago quarter, net income was $28.0 million. Comp sales were the big disappointment, with a fall of 10% versus a 5% decline in the first quarter of fiscal 2013. Gap remained one of the best performers in the sector as revenue climbed 1% in the first quarter to $3.77 billion. Net income was down to $260 million from $333 million in the year-ago quarter mostly because of foreign currency fluctuations. Even with an overall fall in comp sales of 1% across its three main brands, down from a 2% gain in the year-ago quarter, Gap is in a much better position than either Abercrombie & Fitch or American Eagle Outfitters. This is further highlighted by its May sales numbers, which showed that comp sales grew 1% for the month while revenue was up 4% to $1.27 billion. Nevertheless, the chart below shows that the market is hopeful about Abercrombie & Fitch's turnaround. Is Abercrombie & Fitch no longer Abercrombie & Fitch? Abercrombie & Fitch is currently in the process of renovating its Hollister stores and their storefronts. The new storefronts, which are expected to roll out to nearly 100 stores by the end of 2014, are in addition to brighter stores and reduced store music volumes. Abercrombie & Fitch stores are getting their own makeover as well. The stores will have fewer abdominal billboards and more mannequins. The company is currently testing window displays for the first time. As far as the merchandise itself, the company is debuting black clothing and larger sizes. The company is also reducing its signature logo across its entire product line. The company may be changing its Abercrombie & Fitch and Hollister concepts because it is now marketing to customers in their 20s instead of focusing on teen shoppers, which is something both American Eagle Outfitters and Gap already do. Another possibility is that the company is desperate to make these changes in an effort to reverse the trends in quarterly comp sales for its US locations, which include online sales and appear in the chart below. However, changing this much this fast across both of its key store concepts introduces another big dilemma. During its first-quarter conference call, Abercrombie & Fitch admitted that it is currently testing 100% of its product line. Testing everything is costly and it only adds to the company's growing inventory problem. If several products wind up unsuccessful, the company will need to revert to heavy promotions or take a loss on unsold merchandise. Like American Eagle Outfitters and Gap, Abercrombie & Fitch is taking its business abroad. While American Eagle Outfitters plans to enter the UK market, both Abercrombie & Fitch and Gap have entered China . Abercrombie & Fitch sees the potential for over 100 stores in China over the next decade. But this brings up another can of worms. When you add the fact that earlier this year Abercrombie & Fitch stated that it planned to reduce the prices on its merchandise by reducing its manufacturing costs along with all the other changes previously mentioned, which Abercrombie & Fitch will China get? Will China get the one that has existed for decades prior to this year or will it get the newer, almost unrecognizable, version that is still changing today? The number of locations in China Abercrombie & Fitch believes is possible over the next decade. The promotional environment is just the tip of the iceberg that is sinking margins across most apparel companies. Gap now recognizes that the gym-wear industry could provide a big revenue stream. An estimate valued it at $11.5 billion in the US alone last year. Replacing jeans with yoga pants is clearly something that Abercrombie & Fitch should consider among its many changes. A gender shift has also occurred in apparel shoppers. In 2012 and 2013, men's apparel sales outgrew women's with 2013 sales rising 5% to $60.8 billion . Overall, teens have become much less loyal to any single brand . As a result, Abercrombie & Fitch should focus on merchandise that can complement the wardrobes of its competitors. Adding black colored clothes is a good start. Often when a business has many ideas it lacks focus on any one idea. This might be the case for Abercrombie & Fitch right now. With the company making so many changes at the same time, it might have a hard time pinpointing what works and what doesn't. It's clearly possible that the company's stock will continue to move higher in the short term. However, once the company puts its changes in place and their results become apparent, investors will no longer be speculating on whether the changes will work. They will be deciding whether they did.